I connected immediately with Lindbergh’s words in the quote. I’m seldom if ever at the sea all alone, but it always wraps me in a calming sense of solitude. Maybe it’s the immensity of it, underscoring my relatively insignificant presence. Or maybe it’s the sights, sounds, scents and sensations; the rare setting that taps into all five of our senses, leaving the faint taste of salt in our mouths. In any case, as Lindbergh describes, the loneliness I feel by the sea is never an unpleasant experience. In my case, I think it may be the paradox inherent in feeling, through such rich isolation, the presence of deity. It’s as if I am experiencing the omnipresence of God in a highly personal yet universal way. I realize that may sound like so much new-age doubletalk, but if you’ve ever had the sensation yourself, you will know what I mean. In any case, I wish for you today the stimulating loneliness of the sea (so like that of the sky), if only in memory or imagination. As we share the common experience of sanctified solitude, we are brought together in the unending mystery of being part of a vast sea of global humanity, each of us remaining unique, and uniquely loved by God. Someday, when you are gazing at the sunset, an instant after the time the above photo was taken, you may see The Green Flash! WOW, this is fascinating! If I saw it, I might tend to dismiss it as some sort of neurological illusion or vision glitch. Thanks for sharing this info! I too love the sea in all its moods. There’s a feeling of eternal acceptance. Yes, it’s such an intriguing combination of turbulence and calm. During the financial woes that became obvious in 2008, we heard a lot about businesses being rescued because they were “too big to fail.” Not all of us bought into that idea, but when I look at the sea, it really does seem “too big to fail” in the true sense of the words! Thanks for being here today! It’s amazing how clarifying a few minutes (or a few months) in “survival mode” can be! I have never been to Scotland, but I hope someday to go, as my heritage is predominantly Scots Irish (Ulster Scots), as is Jeff’s. I have an idea that their notion of a mild day would freeze me! I’ll be sure to bundle up when I go! What an absolutely divine shot! I, like you, feel connected to our Heavenly Father walking on the beach, watching the sun set or rise! Thanks for sharing your love for His Creation! You’re welcome, Mary Ann. I’m so happy you like the photo! Have a wonderful weekend! Julia, I have said “Thank you, Lord! ” at least one million times in the 28 years that we have lived by the ocean. I love the sunrise and the sunset on these cool fall days. A favorite saying we have is, “If you ever get the SAND in your shoes you can’t get it out!”. We are so blessed and appreciate it. This beautiful creation has calmed many fears and soothed many woes for me. Have a wonderful weekend! Sheila, you are so blessed to have enjoyed the ocean all these years, and now I am blessed just thinking of you enjoying it each morning! Thanks for sharing it and giving me such a lovely mental picture. I would call it “stimulating aloneness.” I recently went to the beach twice, by myself. I hadn’t been in a couple of years, since I was used to taking my kids and they prefer to go with their friends these days, but I’m glad I did. It wasn’t lonely, but very stimulating. Yes, the solitude is wonderful. I just love the sound of the waves, and could sit and watch the water lapping up and back for hours without getting bored, even if I didn’t have a book with me. You’re right, “alone” is never lonely at the beach. I certainly agree with that quote. I have always loved walking by the sea, and often prefer it if I’m alone. There is something very tranquil and calming about it. Have you ever taken Max and Jez to the seashore? I can just imagine they would love it! Max and Jez love the beach. We are lucky in that we live on the coast, but unlucky in that racing around on the sand is not good for either dog’s arthritis. For that reason we don’t take them to the beach very often. I can identify! I’m becoming more acquainted with arthritis all the time, and have noticed that trudging through the sand is getting more and more difficult. Still, as I imagine Max and Jez would understand, it’s almost impossible not to keep trying! There’s a saying that if there are two things that people will never get bored with they would be 1. the sea and 2. elephants. Two of our neighbours back in Kerala (India) owned many elephants, so we got to see elephants every day. But ocean has always been a rare sight. I wish I could live somewhere near the ocean listening to the never ending waves. I agree that I would never be bored by either (although I am not easily bored). How funny that your circumstances are opposite to mine – I see the ocean frequently but almost never am able to see elephants! I had a friend who was an exchange student in Sri Lanka back in 1973, for an entire year. Of all the tales she recounted, one of the few that I remember is that she was able to ride on an elephant. Such massive creatures, mighty yet seemingly so peaceful and benign most of the time. Isn’t Kerala on the Ocean? I think of you now whenever I hear references to Kerala or “God’s Own Country” and remember the beautiful photos of that region, where I very much hope to travel one day. You are right. Whenever we think of Kerala that pictures that come to our mind are those of the coconut trees, the beaches and the backwaters. Unfortunately our district is far away from the ocean though it borders the majestic Vembanad lake. You are welcome to God’s Own Country! http://ajaytao2010.wordpress.com/2013/01/04/alleppey-backwaters-kerela-india/ It’s not by the ocean, but a lovely water scene. You’ve written about the sea so lyrically, I could almost feel the tide rocking me back to sleep this morning 😀 I remember the very first time I saw the Pacific Ocean, I was 13, on holiday with a girlfriend and her parents. I was just blown away and while it was some time ago, my memory holds onto that moment in a way you’ve so eloquently conveyed in your post. It really made me feel utterly small and the world so vast. It’s a much smaller world now with instant communications spanning the globe, but as a teen I just thought WOW. Yes, the ocean fascinated me from the very first time I saw it as a child. I had lived in Miami as an infant, but of course had no memory of that. When our family went to Jekyll Island, Georgia, that was the first time I remember seeing a true beach. Daddy took us “beachcombing” and I learned a new word. So much interesting stuff washing up! And in those days, no trash to speak of. When I saw the Caribbean for the first time, I thought I would never be as enthusiastic the comparatively muddy-looking Atlantic, and the Pacific is a whole other experience. Stunning coastlines, too cold and rough for swimming in most places, but scenery that can’t be beat. 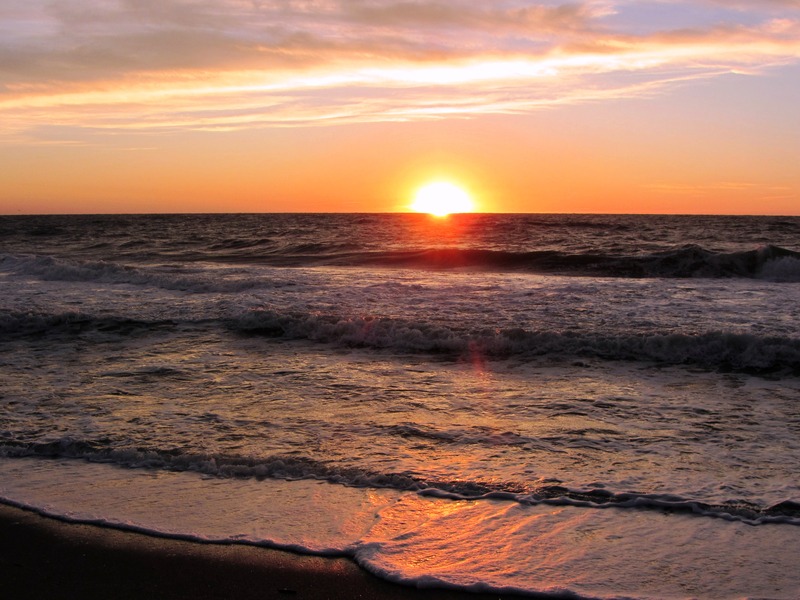 But the photo here is taken in Captiva, on the gulf coast of Florida, where the seashore is also lovely.